A picture from a FLIR thermal camera helped Boston police identify one of the suspects of the marathon bombing incident recently. Boston police employed FLIR’s thermal technology to arrest the suspect, Dzhokhar Tsarnaev who was hiding under the plastic cover of a boat. According to Bill Terre of FLIR, the police knew or had a strong suspicion that the individual was in the boat but couldn't visibly see him. Following the shootout with the suspects the day before, the police were not taking any chances this time. 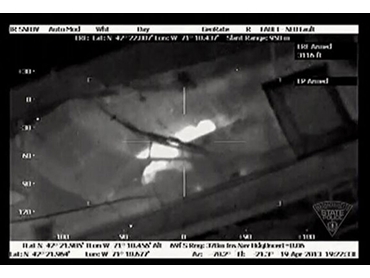 Using thermal technology from a helicopter, they were able to image the boat clearly and see right through the plastic and identify the fact that there was a person in the boat. Although obstructions such as the boat tarp can prevent light from passing through, heat waves are detectable. The technology that was used by Boston police was built in Goleta by FLIR. Terre explains that FLIR’s thermal imaging cameras are useful for securing the borders while search and rescue clearly is another very common application. FLIR’s thermal cameras are also used in the battle against maritime smuggling along the California coast. FLIR thermal cameras are available in Australia from FLIR Systems Australia .